Care to be Different > Articles > NHS Continuing Healthcare > What kind of care needs count in NHS Continuing Healthcare? In NHS Continuing Healthcare, do care needs have to be unpredictable? This week we read yet another misleading press article about NHS Continuing Healthcare. The article was talking about care fees and (to its credit) it did actually mention NHS Continuing Healthcare. However, it then went on to define what kind of care needs count in NHS Continuing Healthcare assessments. It stated that needs have to be unpredictable for someone to qualify for full funding. This is the kind of incorrect and misinformed statement that does so much damage. Sadly it happens over and over – families being given misleading information in news articles, or by people inside and outside the care system who misinform and misdirect (whether knowingly or not). So what kind of care needs count in NHS Continuing Healthcare? ~ A level of priority needs in any one of the four domains that carry this level. Don’t let anyone convince you these scores don’t count. Nowhere does it say that needs have to be unpredictable. Nowhere does it say that these four characteristics (Nature, Intensity, Complexity and Unpredictability) override the scores in the care domains. 3. Keep in mind the local authority legal limit – a level of care beyond which the NHS must – by law – cover the full cost. Care needs do NOT have to be unpredictable to secure NHS Continuing Healthcare funding – and an NHS Continuing Healthcare assessment should take account of the whole picture of need. So when you’re looking at what kind of care needs count in NHS Continuing Healthcare, remember the points above. Tip no. 17: Should social workers attend Continuing Healthcare assessments for self funders? 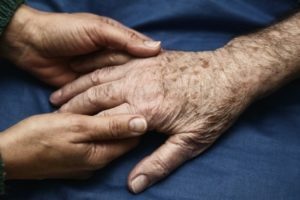 My aunt has been receiving funding for her care. She has been reassessed and I’ve been told as she is no longer mobile due to a fall in the home which resulted in her having a half hip replacement there is only a 50-50 chance that this funding will continue. Everything else has stayed the same. Is this true? I would say your Aunt is now at risk of pressure sores if not turned regularly. If toileting becomes a problem then her skin integrity could be affected again resulting in pressure sores. She may not be mobile but she still has health needs just different ones now. As stated below a health need is related to the treatment, control/prevention of a disease, illness, injury or disability. Read the framework and contact the CHC with this knowledge. 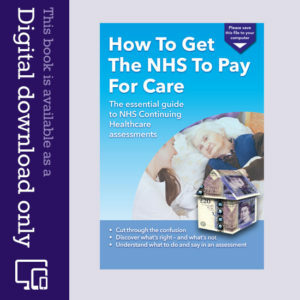 Page 50 NFW – “2.1 Whilst there is not a legal definition of a healthcare need (in the context of NHS continuing healthcare), in general terms it can be said that such a need is one related to the treatment, control or prevention of a disease, illness, injury or disability, and the care or aftercare of a person with these needs (whether or not the tasks involved have to be carried out by a health professional). independence, social interaction, enabling the individual to play a fuller part in society, protecting them in vulnerable situations, helping them to manage complex relationships and (in some circumstances) accessing a care home or other supported accommodation. 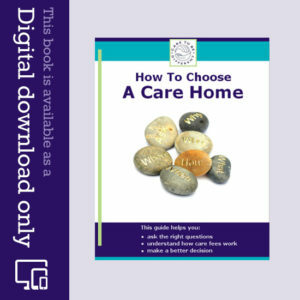 Complicated no if the social services cannot provide the care that you need then they should inform the CCG and your doctor to get the care you need without payment. and differences of Continuing Healthcare.